Some runs of Badboy and Downboy boards have had excess copper protruding from the edge that can cause shorts to ground, which usually destroys the board. If any copper bits stick out around the edge, file them down until flush with the rest of the PC board, then coat the entire edge with non-metalic nail polish (an insulator). Prepare the emitter board and McCapsule body. I use a square needle file to ream out the wire clearance holes to make them just a bit bigger. 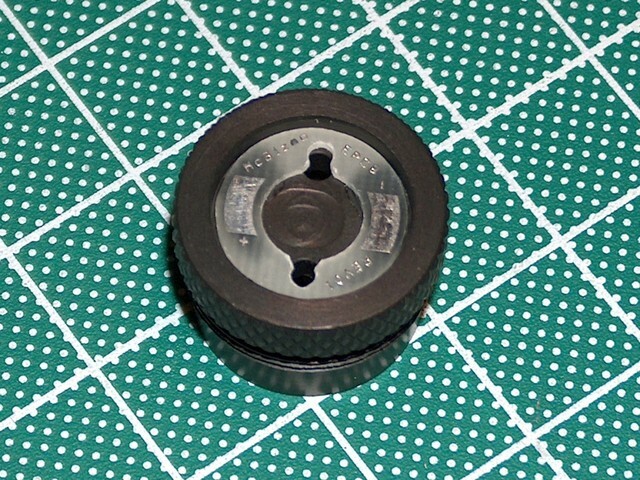 Make sure the board fits cleanly in the top of the McCapsule, and file around the edges if necessary. Super glue the emitter board to the McCapsule, making sure the holes in the board line up with the holes in the McCapsule. Let the glue set. Position the emitter in the center of the board. The tabs on the side of the emitter indicate which side is the cathode (-) and which is the anode (+). The tab with the hole in it indicates the anode, the tab with the notch is the cathode. If you’re using a Luxeon that was removed from a star, the anode side with have a tab that is slightly longer than the cathode side. You may have to trim a bit off of the “feet” of the emitter’s leads so that they don’t touch the inside wall of the McCapsule. I generally clip about half of this foot off. 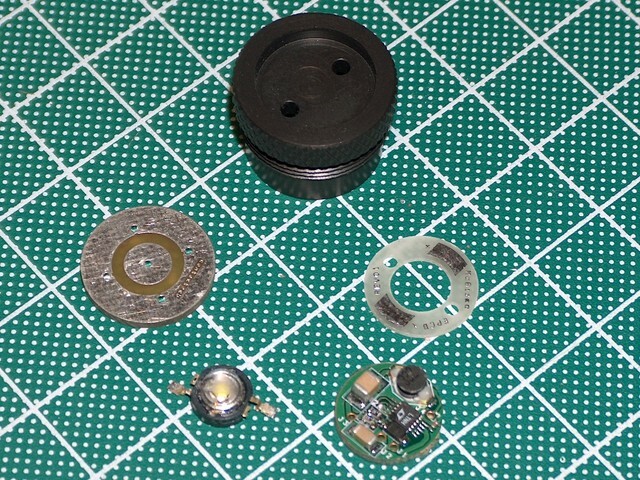 Once you get all of this straight, put a dab of thermal grease (or thermal epoxy) on the McCapsule in the open hole in the emitter board, press the emitter into position, and solder the Luxeon leads to the emitter board pads. This build needs four wires - two from the driver board to the emitter, and two from the driver to the battery contact board. The emitter wires should be about 0.6″ with the insulation stripped off 0.1″ on one end (for the driver board) and 0.2″ on the other end (for the emitter). The other two wires, for the battery contact, should be at least 0.7″ with 0.1″ stripped off of each end. I use 22 AWG solid wire for most of my builds, but I always use stranded wire for the battery contact wires in the McCapsule, as the extra flexibility is a big plus during final assembly. Tin the wires on both ends. When soldering the wires to the board, keep in mind that the component side of the driver should will face the battery contact when the build is complete. The emitter wires will come out of the blank side, and the battery contact wires will come out of the component side. To solder the lead wires to the driver board, simply place the wires in the appropriate holes, hold them in place (with helping hands or self-closing tweezers if possible), and briefly apply the soldering iron to the hole through the opposite side of the board. Just a quick touch with the iron will melt the tinned solder and secure the wire to the hole. See the wiring diagram [qv] for your converter to identify the appropriate holes. For the emitter wires, the red wire goes in the “LED+” or “LED anode” hole and the black wire goes in the “LED-” or “LED cathode” hole. For the battery wires, the red wire goes in the Vin hole and connects to the center of the battery contact board, and the black wire goes to the GND hole and connects to the outside ring of the battery contact board. Now is a good time to make sure the wires are long enough. 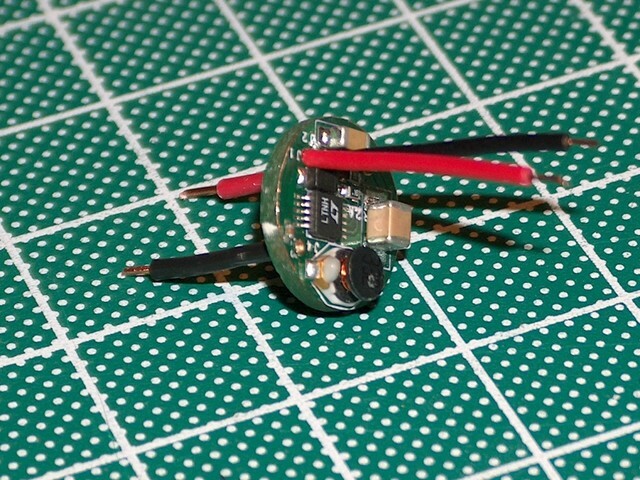 Test-fit the wired board in the McCapsule and check both emitter wires and battery contact wires for adequate length. Now solder the battery contact wires to the battery contact board. Trim any excess on the external side of the board. Add a solder blob to the external Vin pad. Once this is complete, I superglue a small piece of wire insulation to the center of the bare side of the driver board, to prevent the board from coming into direct contact with the McCapsule when the board is potted inside. This isn’t strictly necessary, since the McCapsule is hard anodized and therefore electrically isolated, but it doesn’t hurt, either. Test the emitter and circuit. First, test the emitter itself by applying 3v, using a 2xAA battery holder direct drive if you don’t have a bench power supply (test using 6v if you’re using a Luxeon V emitter). Then test the converter assembly. Press an old beat up Luxeon to the ends of the leads (if you don’t have a scrap emitter it’s fine to use your “production” emitter). Then, power the circuit with a Radio Shack AA battery holder. Just touch the red wire to the center of the battery contact board and the black wire to the edge ring of the battery contact board. If it lights up, you’re good to go. If you’re using a Badboy converter, use 2xAA for 3 watt emitters and 4xAA for 5 watt emitters. If you’re using a Downboy, you should use a 4xAA setup for 3 watt emitters, or a 6xAA setup for 5 watt emitters. Test-fit the driver/battery contact assembly to the McCapsule. Make sure the board slides into the McCapsule easily. 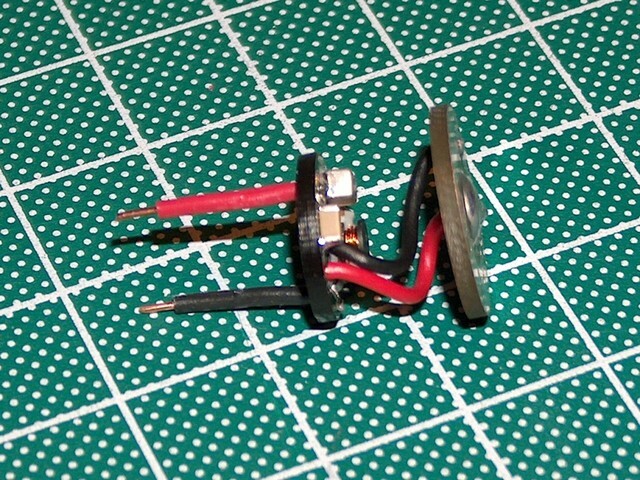 Fold the emitter wires down to make sure they are long enough to reach the solder pads. Check that the battery contact board fits in the bottom of the McCapsule correctly. Take everything apart (trim the leads or wires if needed) and redo the power test. Mix up the potting bog. Arctic Alumina is the standard, but any non-conductive thermal epoxy should work (i.e. you want it to conduct heat, but not electricity). You have to keep moving from here on so the epoxy doesn’t get too thick on you. Don’t rush, but don’t play around. Just stay focused and you’ll be OK.
About two pea-sized drops of each component should be plenty. Mix the components together, then begin potting the McCapsule. Start with just a dab around the emitter wires on the bare side of the driver board, then carefully insert the board into the McCapsule cavity. Cover the component side with potting bog. You don’t need to fill the cavity up, just use enough to coat the driver. Make sure it covers to the edge of the board and up the side of the cavity wall, as that is what will keep the driver in place. Also try to get the wire joints completely surronded by goop, since these will be the weakest physical points in your assembly and the epoxy will immobilize the joints. 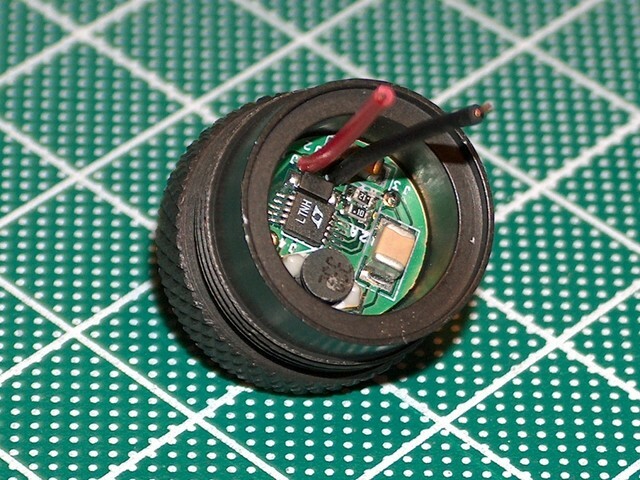 Dab a little bit around the bottom lip of the McCapsule and press the battery contact board into place. Fold the emitter wires down to the correct solder pads (black to - and red to +) and squeeze the McCapsule and battery contact board together. A vise with rubber-lined jaws is great for this. Let the epoxy cure for at least thirty minutes, preferably more. 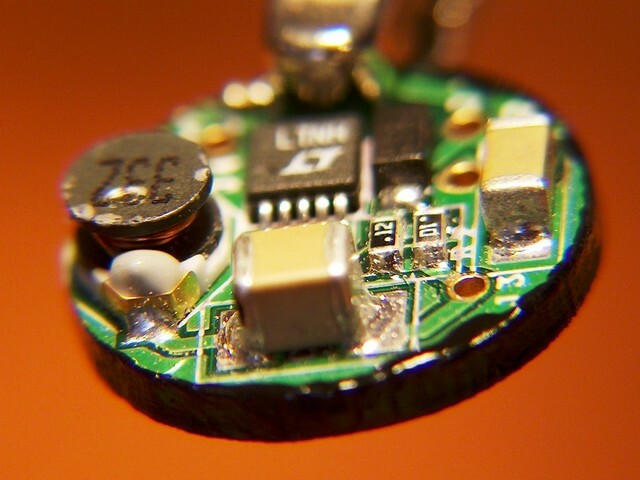 Using a small flat-bladed screwdriver, push the wire down onto the emitter lead on top of the solder pad, and briefly apply heat from the soldering iron. If you tinned the wires well, the solder will flow and bind the wire and emitter lead to the solder pad. Repeat for the other wire/lead. 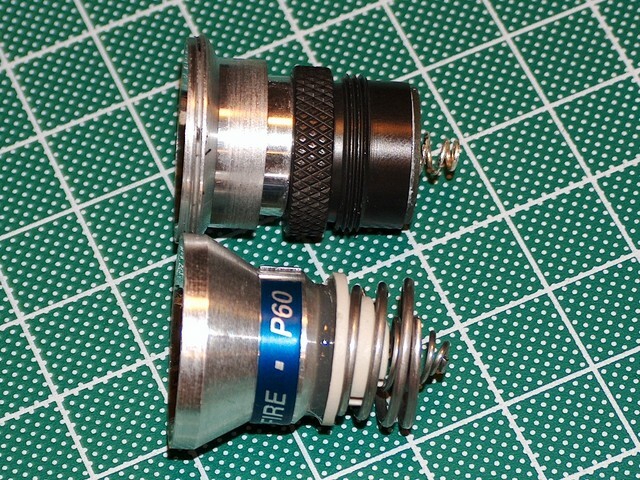 You want to keep these joints as tidy as possible so they don’t short against the reflector. All exposed metal should be below the top edge of the McCapsule, with only the dome of the Luxeon poking above. Test the McCapsule as in the power test above. Assuming it works, cover the two joints with nail polish and let that dry. You may need to add a contact spring to the battery contact board. For standard Surefire lock-out tailcaps, it usually isn’t necessary, but it is a definite must for use with Surefire “clickie” tailcaps such as the Z48 and Z49. 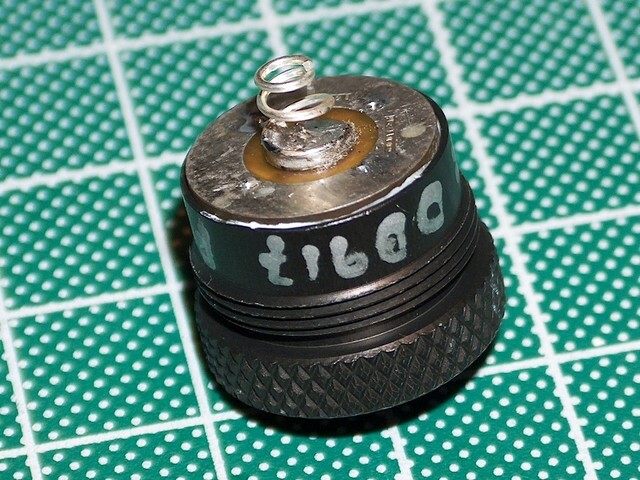 Take an Aleph tailcap spring and cut it in half using hard wire cutters. Discard the bottom half of the spring, and solder the top half to the solder blob on the battery contact board. 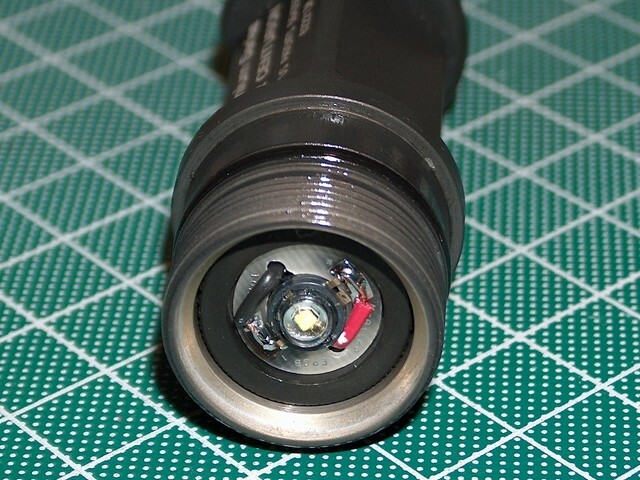 Unscrew the Surefire bezel unit and remove the lamp assembly. Place threaded reflector in the bezel and screw in all the way. 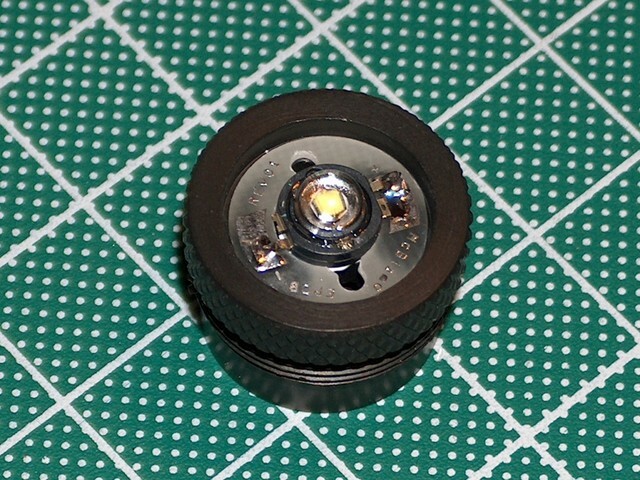 The reflector will “float” inside the head once it gets past the top of the threads. Drop the McCapsule into the body of the light, then screw the head down onto the body. Note that the head will most likely bottom out about 2mm short of fully screwing down all the way. This is normal due to the size of the McCapsule and should not cause problems as the o-rings are properly engaged at this point. Do not power up the McCapsule yet. 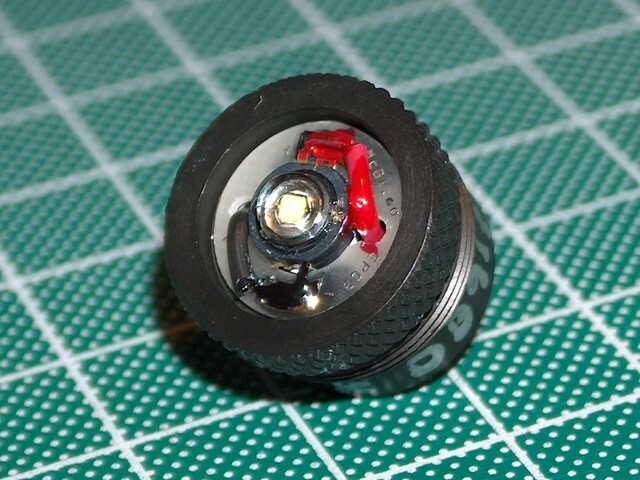 Unscrew the head and inspect the nail polish on the McCapsule. If it has rubbed off, the joint is poking above the edge of the McCapsule and is rubbing against the reflector, which will eventually cause a short. Rework as needed. If no rubbing is apparent, replace the head, remove the head and reinspect. If no rubbing is visible after two or three more tests, you’re good to go. 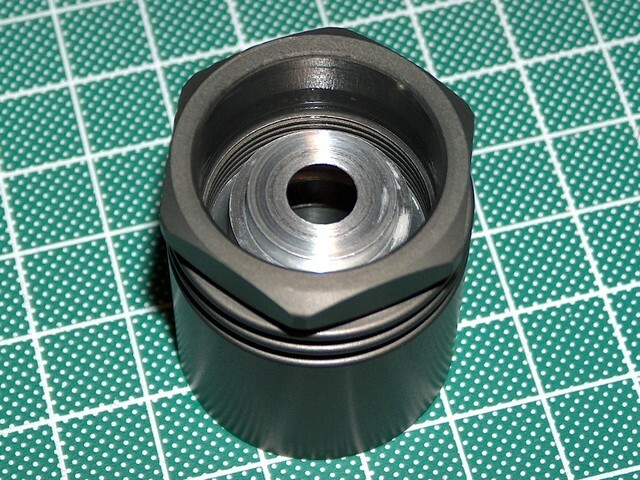 Note that the black anodizing on the McCapsule will rub off due to contact with the reflector. This is normal and unavoidable, though it should not cause any problems. That’s it. Your McCapsule is now ready for use. Be sure to use the McCapsule only with voltages suitable for your power converter and emitter combinations. For one or three watt emitters with a Badboy converter, 3v is recommended. For one or three watt emitters with a Downboy converter, anything from 4.5v-12v is fine. For five watt emitters with a Badboy, 6v is optimal, but 3v will work at slightly reduced brightness. For five watt emitters with a Downboy, 9-16 volts is fine. Do not exceed recommended voltages for Badboy converters, as input voltage above the emitter’s forward voltage will damage the converter. When using Downboy converters, input voltages below the optimal range will not damage the circuit, and will simply place the circuit in direct-drive mode. Note also that the thermal path for this mod is less than optimal. 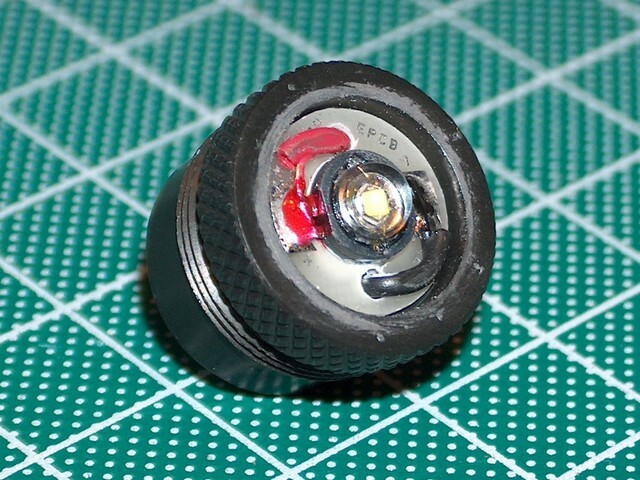 There are no large areas of contact between the McCapsule and the flashlight body. 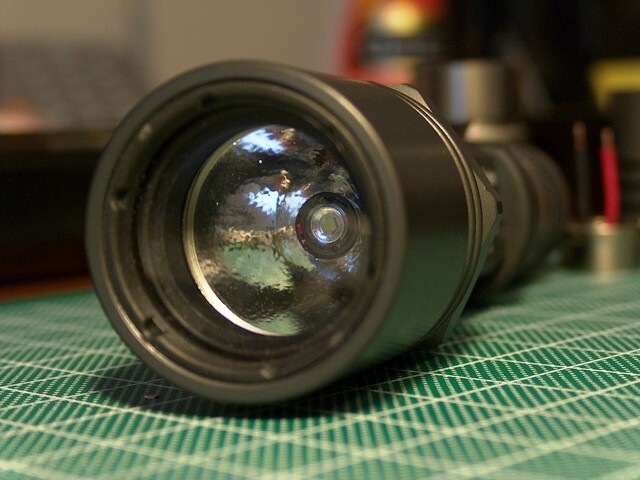 The largest direct thermal path will actually be through the reflector to the head of the flashlight. McCapsules built with Luxeon III emitters are probably not going to experience many heat issues, this is only likely to be a serious issue with higher-power five-watt builds. Just be aware of it and monitor the McCapsule when you first start using it until you get comfortable with its heat characteristics. This entry was posted on Friday, October 8th, 2004 at 0:06	and is filed under Surefire. You can follow any responses to this entry through the RSS 2.0 feed. Both comments and pings are currently closed.